Many people call Assen the Cathedral of Motorcycling. Bit of an old cliche that one, but it does produce good racing. There is an extra buzz about race day morning because you just know there is going to be a race even better than usual. The track is no longer what it was, and that is not going to change, but Assen allowed us to see motorcycle racers return to form. Two of them, in fact: Valentino Rossi and Nicky Hayden. Valentino Rossi was nowhere in the rain of qualifying, but he stormed through to win the race form 11th on the grid with his wacky FIAT 500 livery. It was just like the old days. The really old days ... 1997 to be precise. Rossi was on fire that year, winning eleven races on the little Nastro Azzuro Aprilia 125. It was the first time we had really seen the wacky celebrations on the cooling-down lap and the sun and moon crash helmet began to get embedded in our minds. Assen 125cc 1997 was a mad race. The top five came over the line covered by 0.8s, with Rossi to the fore after having battled with a clutch lever that was playing up. The way he just beat the hell out of it while still keeping up with the others, almost not looking where he was going, was very Rossi. We were soon to understand how Rossi it was in years after when he wore a Superman cape on the cooling-down lap while carrying a blow-up medieval mace, clobbering his opponents over the head as he made his way back to the pits. In a bizarre way, 1997 was similar to last weekend. Back then, Rossi was deep in the field, but fought through to beat the ever-smiling Tomomi Manako by a tenth at the very last corner. It was one of the greatest races I have commentated on. I still have the original broadcast recorded on VHS. It's in the 'keeper' box. I will never, ever forget it, and Valentino tells me he won't either. 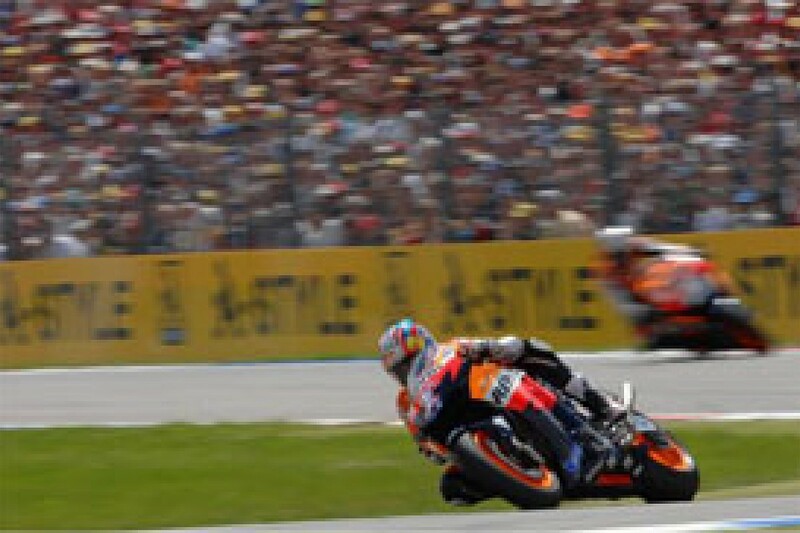 Last weekend's 2007 race with Rossi at Assen wasn't so mad with regards to the barnstorming finish of a decade earlier, but the similarities were there. He was totally at one with the bike underneath him, and the sight of him fighting through from nowhere during those early laps was just fantastic to watch. All that talk of the electronics and the emasculation of the lairy-hairy bikes had gone away for the afternoon, as you could just see how fast he was actually riding it. As I said on the commentary, the Mugello win seemed an awful long time ago, but not as long a time ago as Nicky Hayden's last win on a Honda. That, as poor ol' Nicky knows, was last July at Laguna. What was great about Hayden being back up there on the podium was that he was the leading Honda, as he was so many times last year en route to the world title. He beat Honda's great hope for the future, Dani Pedrosa, who is in the throes of talking to Honda about renewing his deal with Big Red for next year and beyond. These are important days for Hayden though, for if Pedrosa gets distracted and Nicky can get a result at the Sachsenring, then the Kentucky Kid might just hit full revs by Sunday afternoon at Laguna Seca the following weekend. For Hayden, the odds look pretty fine for Sachsenring as it is one of his favourite tracks and it's a left handed track, similar to his roots of dirt tracking back in the USA. Earlier this year Hayden was the top Michelin finisher at the only other left handed track we've been to - Istanbul. The glint in Hayden's eye at Donington when the Repsol Honda boys were one-two in the wet on Friday was great to see again, the American having spent most of 2007 in the doldrums. "Parts are actually coming slow. We need to speed things up" he said at Assen. Honda plans to bring some parts to Brno on August 17th, giving Hayden confidence that things are going to work, unlike the current set-up that he'd struggled with for much of this year. But that all changed just before the start of the Assen race. "On the warm up lap I remember feeling this is the best the bike has felt all year. I just couldn't ride the bike hard for a few races (before today)," he said. "I was enjoying riding today. It's so much more fun to be up front. When you're going backwards, waiting for the laps to tick away, it is miserable." Laguna is a very important race for the Hayden clan. Father Earl told me as such last year while they had their pen hovering over a Ducati contract in September, but his lad thinks he can get the locals whooping on the hillsides of the track. "I'm going to bring all I got there. I told my boys back home, as they've been giving me a hard time, 'don't refund their plane tickets!' They probably can't carry the ticket over to the next year at Indy!" he said. "I told them as I knew I had a couple of tracks coming up that I liked. So I'm sure looking forward to that one." Sachsenring is a cracking track for racing run by the brilliant local branch of the ADAC. They run a very tight ship, selling the place out the very first time the championship went there back in 1998 after the disaster of 13,000 people at the wet Nurburgring the year before. It has grown bigger and bigger every year since, so I hope that Hayden can further find his form. And if Hayden does find his form, what of Stoner and his loss of the Assen race to Rossi's 11th on the grid? He complained about the fairing afterwards, saying it buffeted him about a bit, making it hard to drop it into the corners and change direction. There is a fairing that Ducati have got that is maybe four km/h slower on the straights, and in theory a bit better to chuck around the corners, but Vito Gaureschi the test rider cannot really put his finger on whether it is better around a lap. I pointed out to Stoner that the 'quick' fairing had won him more than five points over the previous eight races, despite the fact that he gets annoyed with people saying how the bike has won the races rather than the rider. The advantage of the Ducati assists Stoner in not leaning on the front tyre too much - his downfall last year - and being a loony on the brakes into every single corner, whereas Valentino is riding the wheels off his Yamaha into every braking zone, just to keep up. So, we have Rossi who is back riding like the wind, Hayden who is joking and a mildly-irked Australian who was beaten. All things are good for the future, as Aussies don't stay down for long, reappearing with fighting punches. Here we are at the half-way point of the title chase, but I can see this title going right down to the wire with Rossi and Stoner because the Honda lot won't be far behind in these remaining races.